What does it take to become a pilot? Join us as John Laity gives us insight into his inspiring pilot journey. John Laity is a pilot engineer and pilot with over eighteen years flying experience in ultralights. He co-founded Flying for Freedom in 2010 in response to the large number of injured and wounded veterans who applied to be a part of the British Antarctic Microlight Expedition. Flying for Freedom is now funded and supported by the Duke and Duchess of Cambridge and Prince Harry via their endeavour fund. Further supporting the course, both Prince Harry and Prince George are proud owners of special Flying for Freedom flying suits. John’s grandfather was a Lancaster pilot in the Second World War and continued to fly multi-engine aircrafts after the war. Unfortunately, his grandfather was stricken with Alzheimer’s so he’d take him to airshows as some sort of getaway. The weather is the biggest challenge for John. Flying a microlight can be very different from flying other types of aircraft because it is lighter and draggy and can go a lot slower at 55 to 60 miles per hour. CFM Shadow – very fantastic visibility, looks a bit like a power glider. QuikR – closest to his heart because it’s a very fast, flexwing-type microlight. John completed his PPL at Cotswold Airport (formerly Kemble) and flew locally. He even built his own X-Air and made his stepfather’s golf putting green as a runway. 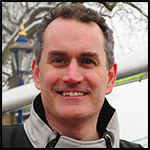 In 2002, John ran a marketing agency and helped raise funds for the 1st British army Antarctic expedition. He also did this in 2004 and 2006. In 2008, John’s airstrip sat right on the edge of the Lyneham airspace and saw the wounded and injured soldiers coming back from Afghanistan. 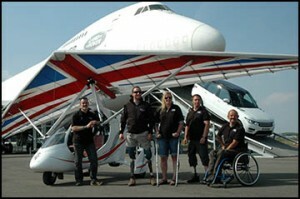 Had an idea to raise money for Help for Heroes through an expedition to Antarctica using microlights. Decided to make the disabled veterans as pilots for the expedition but had some setbacks. Problem was solved by putting up a flight school to accommodate the demand. Thus, Flying for Freedom was born. Lots of trips in cold locations including Sweden and flight testing for the Antarctic expedition. 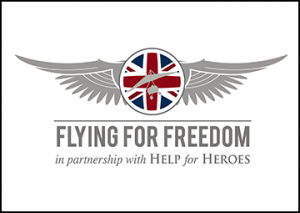 Two of the Pilots from Flying for Freedom qualified for the Endeavour fund Spitfire scholarship at Bigby and will be announced by Prince Harry himself. Set world records, share the Flying for Freedom model, explain how it works, grow the concept and make disability flying well-known in all parts of the world such as the United States, Australia, and New Zealand.